After weeks of being fixated on grim economic news, the mainstream media narrative shifted dramatically last week to a mix of dramatic international events. 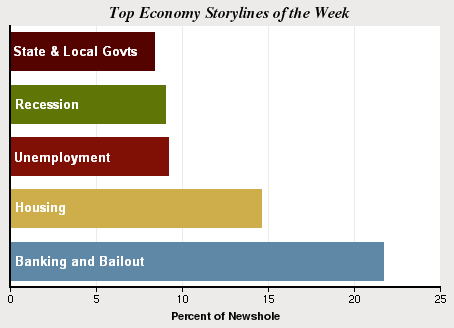 Coverage of the economic meltdown fell to 15% of the newshole the week of April 6-12, according to the Pew Research Center’s Project for Excellence in Journalism. That is the lowest level of attention to that subject since the week of President Obama’s inauguration. As recently as the last week in March, the story had accounted for 41% of the coverage examined by PEJ’s News Coverage Index. Not only was the faltering economy a smaller story last week, but for much of the year, other major weekly stories often intersected with the financial health of the nation. That was not the case last week. Four of the five biggest stories were unrelated to the financial crisis and together, they filled nearly one third of the overall newshole. The No. 2 story, just behind the economy at 14%, was the Somali pirates who targeted a U.S. merchant ship and triggered a high-stakes hostage drama. Next (at 8%) was Obama’s overseas trip, where the media focus was on his visit to Turkey and continued outreach to the Islamic world. And two foreign crises of a very different nature rounded out the week’s top-five list—the deadly earthquake in Italy (6%) and the North Korean launch of a long-range missile in defiance of much of the international community (4%). With no single story exceeding 15% of the newshole, last week’s news agenda was the most balanced since the week of December 29-January 4 when the press narrative was divided among the fighting between Israel and Hamas in Gaza (21%), the economic crisis (13%), the “pay for play” scandal enveloping Illinois Governor Rod Blagojevich (10%) and the incoming Obama Administration (8%). Last week was also the biggest one for international coverage in 2009. So does this dramatic pivot in coverage suggest a significant shift in attention away from the grim economy— the story that has overwhelmed the national narrative since Obama took office? It’s probably premature to think so, given that many components—from the stimulus package to the stock market to the financial sector bailout—are likely to be major newsmakers for the foreseeable future. But it may signal something that the economy was not pushed aside by a single overarching story but a series of them, and stories that earlier in the year might have generated less attention. And in one a sure sign there was no major economic news last week, some coverage of the financial situation was the man-bites-dog variety—a few rays of hopeful news. As coverage dropped, the economic crisis last week was the top story in only the newspaper sector, where it filled 24% of the front-page newshole. It fell to the No. 3 story online, on cable news and in the radio sector. The top financial component, as was the case in the two previous weeks, was the troubled banking sector, which accounted for 22% of the economic coverage. That was followed, at 15%, by attention to the housing crunch with the job market the No. 3 storyline, at 9%. One twist to the narrative last week included some bright spots, or at least brighter ones, in a situation that has frequently invited comparisons with the Great Depression. On the April 9 newscast, CBS anchor Katie Couric reported that better-than-expected profits for Wells Fargo helped drive the Dow Jones up nearly 250 points. “So are banks back?” she asked correspondent Anthony Mason. Relatively speaking, that’s a burst of optimism. At 14% of the newshole, the saga of the Somali pirates, which ended with the rescue of Captain Richard Phillips, was the biggest foreign story since the Gaza war in early January. (That does not include the March 30-April 5 coverage of the G-2 Summit, which was dominated by economics.) The pirate drama was the No. 1 story online (14%), in network TV (15%), on radio news (15%) and on cable news (19%). While much of the coverage simply followed the fast-moving situation, some of the commentary was focused on the need for the U.S. and the shipping industry to get tougher—something that occurred outside the time frame of this week. On Campbell Brown’s April 10 CNN show, guest host Roland Martin played a call from someone advocating a potent military response. “I believe that the United States should send their warships over there to let the pirates know that they’re not playing around and that if they touch anything with U.S. flags on it, there will be a penalty to pay,” the viewer declared. On his Fox News Channel show, Bill O’Reilly put the onus on the shipping companies, advising them to hire security guards. Other conservative talkers accused the administration of not acting forcefully enough. In the aftermath of the sudden resolution to the crisis—when Navy SEAL snipers killed three pirates—it’s quite possible that Obama will get a boost from the political narrative connected to this saga. The No. 3 story, at 8% of the newshole, was the latter part of Obama’s European summitry with attention focused on his trip to Turkey, a U.S. ally and a Muslim country. Continuing a theme in the previous week’s coverage of the G-20 Summit, the narrative alighted on Obama’s more conciliatory approach to foreign policy than his predecessor’s. The fourth-biggest story of the week (6% of the newshole) was coverage of the devastating earthquake in Italy that struck in L’Aquila and killed nearly 300 people. It was the second biggest story of the week online, at 12% of the newshole studied. The No. 5 story, at 4%, was primarily about the furor triggered by the launch of the North Korean missile, although some attention was also devoted to the first public appearance of that nation’s leader, Kim Jong Il, after widespread speculation that he was seriously ill.
As the economy dropped as a story, so to a degree did the President’s coverage. 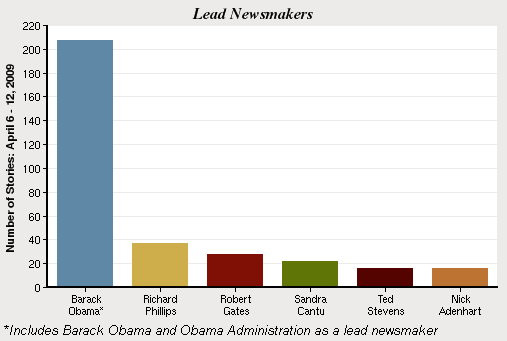 Obama registered as a lead newsmaker in 15% of the stories from April 6-12—down from 20% the previous week. What followed was a fairly eclectic group of major headline generators. The fourth-biggest newsmaker (2%) was the focal point of a tragedy. Sandra Cantu was the eight-year-old California girl reported missing in late March and found murdered earlier this month. A 28-year-old female Sunday school teacher has been arrested in the case. Rounding out the top-five roster, at 1%, was former Alaska Senator Ted Stevens, whose conviction on corruption charges was overturned last week amid allegations of prosecutorial errors and misconduct. He was also tied, at 1%, by Nick Adenhart, the young Angels pitcher killed by an alleged drunk driver hours after he threw six shutout innings for the team.